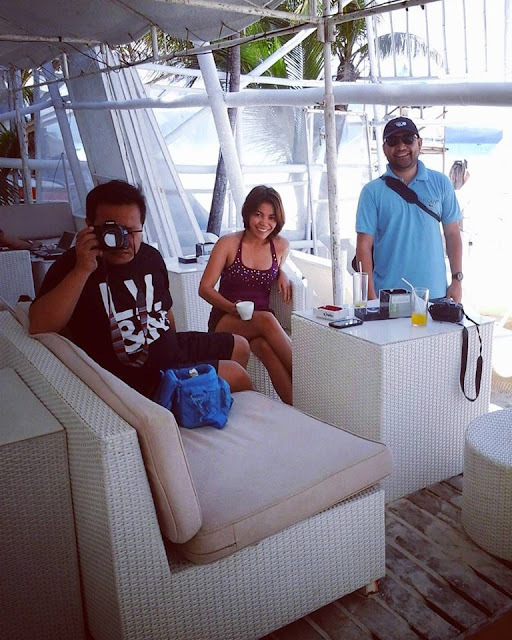 If there is one hotel in Boracay Island that I had fond memories of, it is the White House Boracay. Exactly three years ago, I shared memories with other guests and close friends drinking beer and cocktails, engaging in a gastronomic seafood feast and simply witnessing a day unfold in one corner of the hotel’s Beach Lounge. Fast forward on one morning of September 2015 (days after my birthday), my travel buddies and I were positioned at the beach front with an obstructed view on account of the season, necessarily composed of white rattan loungers, parasols and soft cushions, making it a perfect sanctuary and a moment for me to reflect and rekindle the memories of what has been. I surely miss my friends who I was with years ago as majority of them migrated abroad, others missing (by choice) while I opted to stay as is for the practice of my profession, BUT, new and happier memories were created while I came back to the island with my closest friends in travel and I am grateful that they were my companions in making a comeback to a very memorable hotel. We had an evening flight from Manila and arrived quite late for check-in at the hotel. There was absolute silence as we approached the reception area. I envisioned a house party with loud music played by a DJ at the pool bar and that guest’s dance unmindful of time and movements. But there was none – a totally different scene from years back. Room amenities and facilities are the basics – air-conditioning, en suite bathroom with hot water and toilet that comes with a bidet (very important for me), wireless internet, cable TV and a private veranda. The soft and clean high-quality mattress, pillows and duvet provided me a comfortable and rejuvenating sleep. I had a quality sleep while at the hotel. Complimentary a la carte breakfast was served at Station Juan Café. We were given choices on the type of cuisine and as always, I go for the Filipino breakfast (tapsilog it is for the first day and tocilog for the second day). The concept of Station Juan Café is to be reminiscent of our childhood holidays at the beach. Menu is simplified and moderately priced at a range of PhP200.00 to PhP400.00 of traditional Filipino and international cuisine, prepared by their in-house chef Martin Jickain. The no-frill yet inviting café is good place to start the day at the island – tranquil and refreshing vibe. The café is open daily from 7AM to 10PM and even non-guests are welcome. If there is one area of the hotel which makes it a standout from all the other more than 400 hotels of Boracay Island, it is their beach lounge. I had a vivid picture of the White House Beach Lounge with an unobstructed view of the white beach and the best vantage for sunset viewing. Habagat season however has caused a limited view on our case. Beach front properties were made to set up windbreakers made of bamboo and mesh or plastic sheets to protect guests from the strong winds that may carry sand. The 150-seater White House Beach Lounge has been renovated, which new look is said to be inspired by Blu Marlin Ibiza. Operating hours has been limited from 7:00AM to 10:00PM. There’s a new bar and DJ booth surrounding the indoor pool as well. After breakfast, our mornings were spent at the loungers doing the art of nothing. This is the beauty of having like-minded companions for travel, the common passion is to chill and relax at the beach without imposed itineraries. Planning an itinerary is welcome but definitely revisions are most welcome. Even on a relatively early morning, the bar serves specialty cocktails by Tim Walters and the World of Beers in Below Zero Beer fridges. And while we loiter and slightly nurse our hangover over glasses of water, some guests started their drinking spree. The happiest hour is at 7:00AM to 7:00PM. But apart from the perfect seat to drink, the Beach Lounge offers outstanding cuisine as well. Offering is a fusion of Asian and continental with best-sellers cochinillo, panizza, Bagnet kare-kare, Tomahawk Steak and Sisig Foie Gras. The White House Boracay may have changed its façade but it continues to be one of my transient abodes while at Station 1 of the White Beach of Boracay.